Join dots as shown above and erase the extra dots. Draw thick lines and fill with desired colour powders. Please illustrate kolam no99 with dots and lines for our convenience. I have given dot and line details for the above kolam. 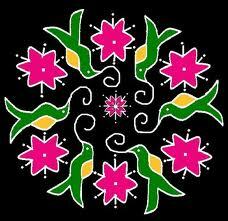 Hope now you can draw this kolam. I must say your blog is one of the best sites on kolams. All kolams are very nice..